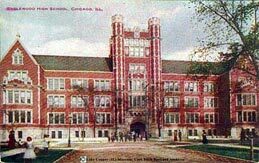 Englewood High School, 6201 S. Stewart, was only a few blocks from Dot's home [see map]. Englewood's school colors were purple and white; its teams were the Eagles. 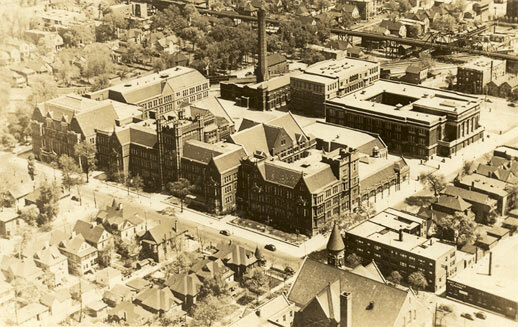 Founded in 1874, the original “castle” structure has been lost in the name of progress. 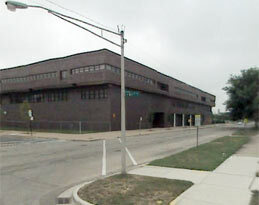 A modernized version of the school bears the official name of Englewood Technical Prep Academy. 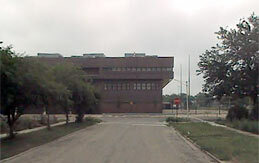 Nevertheless, it is still commonly referred to as Englewood High School. 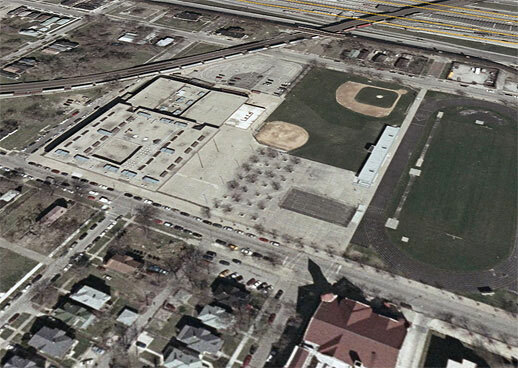 Above: Englewood High School, looking south on Stewart Ave., then and now. 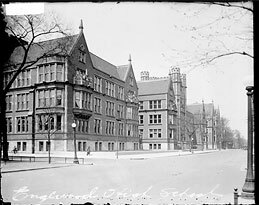 Above, at left: looking east from 62nd Street, the beautiful old school's main entrance fronting a cobblestoned Stewart Ave. At right, a rather drab, present-day view of Englewood Technical Prep Academy from roughly the same location. Above: a circa 1939 aerial view of the Englewood High School campus, and a recent google satellite image of the same area. The peaked-roof building in the center-right foreground with the pointed tower is visible in both photos. Since 1956, this structure has been the home of the Antioch Missionary Baptist Church. Regrettably, only a few other structures besides the church now remain. The yellow-highlighted highway (bottom photo, top) is U.S. Interstate 90/94, also known as the Dan Ryan Expressway. Completed in the mid-1960s, the road uprooted buildings and thousands of families in its wide, north-south path. The “L” train or--as it was known in 1945-46--South Side Elevated rapid transit system that carried Dot & co. north to the Loop ran over the trestle bridge at the top right of the old photo. The same bridge is visible in the modern-day photo at top-center, parallel to I-90/94, but over the years it has shed its former gridwork. The CTA presently refers to this L route as the Green Line. Crossing diagonally and adjacent to the school property was the Pennsylvania railroad, which later became Conrail and, today, the Norfolk Southern.